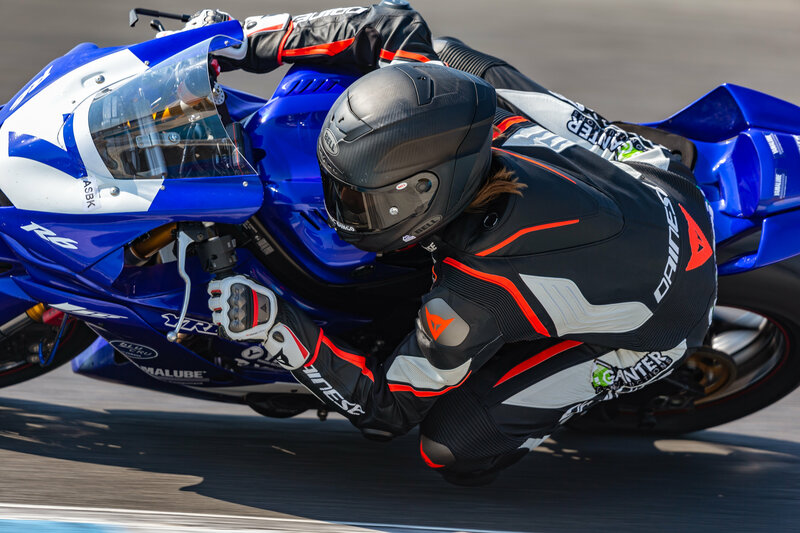 Today marked the explosive commencement of the 2019 Australian Superbike Championship (ASBK) season, as riders and teams got down to business at the Phillip Island Grand Prix Circuit for the Official ASBK Test. Temperatures in the mid 30’s meant that riders were treated to superb track conditions offering plenty of grip and the opportunity to stretch their legs after a long off-season. Wayne Maxwell (Team Suzuki ECSTAR, Suzuki GSX-R EL R),Tom Toparis (Landbridge Yamaha, Yamaha YZF-R6) and Locky Taylor (YRD, Yamaha R3 321) closed off today with the fastest overall lap times for their respective classes. Maxwell put in a brave performance to take out fastest in the Kawasaki Superbike class, despite an operation on his collarbone only nine days ago. The test also saw the first-ever appearance of the bLU cRU Oceania Junior Cup, a brand new Junior Road Race Academy featuring 25 of Australia’s brightest junior riders. A Phillip Island Grand Prix Circuit regular, Saturday treated Wayne Maxwell very well. Clocking in the fastest time for the Kawasaki Superbike class of 1:32.913, Maxwell was feeling right at home on the new Suzuki frame as he navigated ‘The Island’s’ undulating slopes and tight corners. “I’m really happy to be back with Team Suzuki ECSTAR on the GSX-R. You have these doubts that creep in at the start because everything is so foreign but I came into today with a clear goal of not only winning but also making a contribution to build a strong team,” explained Maxwell. Coming in hot after Maxwell was Troy Bayliss (Ducati Panigale FE) with a 1:33.011, who finished twice at the top of the timesheets across Day One of the Official ASBK Test. Behind Bayliss by .170 was Bryan Staring (Kawasaki Bcperformance, Kawasaki ZX10RR) with the third fastest time for Day One of 1:33.181. Staring took his time throughout the course of the day to find his feet, but neither the first day nerves nor the Phillip Island circuit could dissuade Staring from finishing the day with the third fastest time overall. Josh Waters (Team Suzuki ECSTAR, Suzuki GSX-R EL R) finished Day One with a fastest time of 1:33:334. 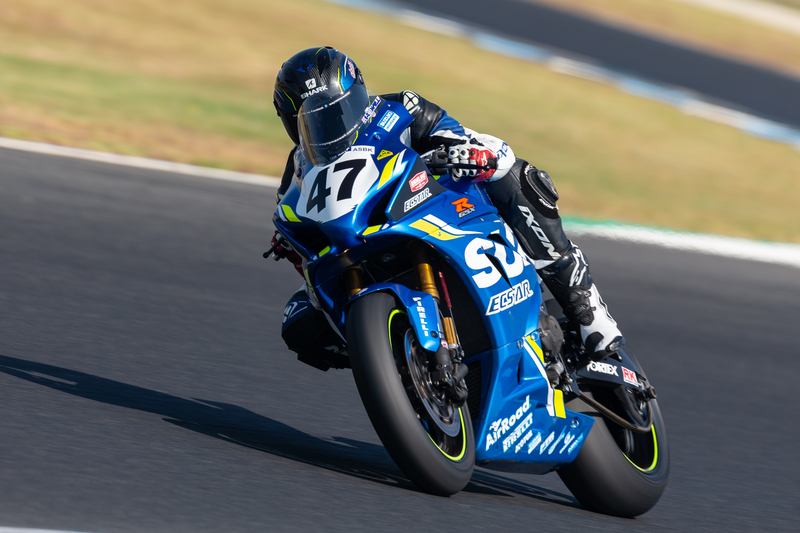 It took the 2017 ASBK Champion no time to ease on into the first day of the 2019 season, appearing toward the top of the timesheets throughout the day. Rounding out the top five fastest lap times was Aiden Wagner (Yamaha YZF-R1), with a best time of 1:33:452. Wagner has rung out clear to the Kawasaki Superbike class that he means business in the 2019 season, featuring regularly throughout the day in the top five places. Reigning ASBK Champion, Troy Herfoss (Penrite Honda Racing, Honda CBR RR SP) finished with the sixth fastest time of 1:33:500. The first session of the Supersport class saw Tom Toparis getting his year off to a good start, in what serves as a warm up for his racing season, which now also includes a wildcard entry in Round 1 of the FIM World Supersport Championship at the end of the month. “Awesome to be on the Yamaha this year, I’m really grateful for the opportunity to ride the R6” Toparis remarked after the first session. He’s new to the team and the bike, but nothing could stop Locky Taylor in taking out the fastest overall lap time in the YMI Supersport 300 and YMF R3 Cup classes. Taylor clocked in a fastest time of 1:49.429, ahead of Seth Crump (Rockoil, KTM RC 390) who finishes Day One with the second fastest overall time of 1:49.768. Reflecting on the day, Taylor couldn’t be happier with the overall result, highlighting “It was an excellent day! Today saw me start afresh with a new bike and team, and I am so thankful for Demmery Motorsport and my mechanic because they have worked so hard on my bike. Today was the first day on the bike and it handled beautifully. “Tomorrow I’m planning to remain consistent and work with my teammate, Zac Levy. It’s really great having Zac as a teammate! We feed off one another on and off the bike, and this weekend will be especially valuable in preparing us both for Round 1 later this month,” explained Taylor. Third fastest overall today was Callum O’Brien (BC Performance, Kawasaki Ninja 400), who featured consistently at the top of the leader board throughout the day. O’Brien finished Day One of the Official ASBK Test with a top lap time of 1:49.939. Hot on the heels of O’Brien was Zac Levy (Demmery Motorsport, Yamaha R3 321), who clocked in a speedy time of 1:50.109. Rounding out the top five for the day was Luke Power (RTR, Yamaha R3 321) with a best time of 1:50.423. 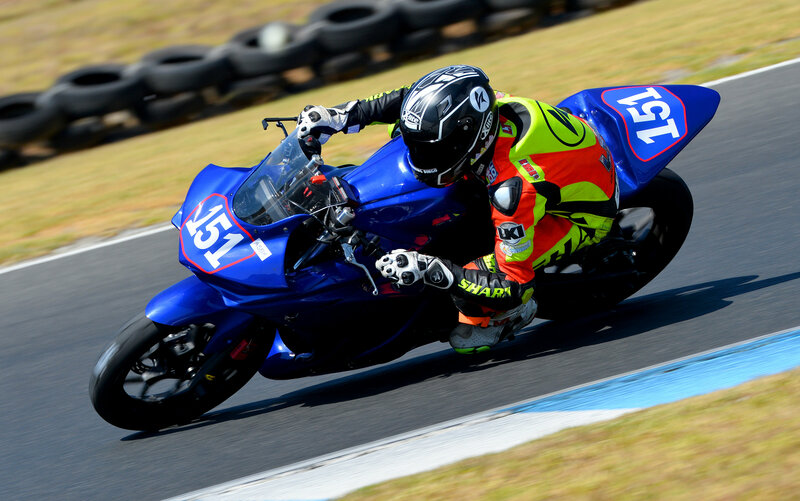 The first ever practice session for the bLU cRU Oceania Junior Cup, kicked off the day as the first time Motorcycling Australia’s Junior Road Race Academy program had ever taken to the track. Tune in tomorrow for the second and final day of the Official ASBK Test, which is set to be a scorcher! Keep your finger on the pulse by checking out the ASBK website, ASBK Facebook, Twitter and Instagram!